Powder coated frames, stainless steel coil wrap, schedule 80 coil, adjustable thermostat, high limit over temp protection, safety pop-off over pressure protection, 9 gallon fuel tank on diesel models, inline flow switch, 35 foot cord with GFCI on 115 volt models, 10" pneumatic tires on portable model. LP Hot Boxes include regulator and hoses. All units are completely factory assembled and tested in the USA and delivered ready to operate. These models are to be used in conjunction with an existing pressure washer. These models are to be used with existing pressure washers. All units are completely factory assembled and tested in the USA and delivered ready to operate. 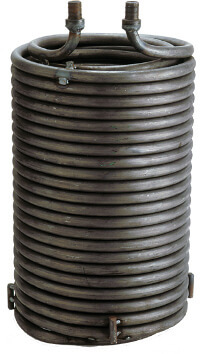 Minimum requirements: 2 x 60lbs LP tanks for 6 to 8 hours operation. 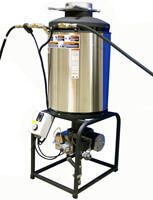 This Hot Box attaches to a cold water pressure washer and converts it into a hot water cleaning machine. The cold water pressure washer sends the high-pressure water into the Bot Box which heats the water before dispatching it to the wand. When the gun is pulled, the burner automatically fires and stops when the gun is released. Simply quick couple the Bot Box's jumper hose to almost any cold water pressure washer, and attach the pressure washers hose, gun, wand and nozzles to the outlet on the Bot Box. 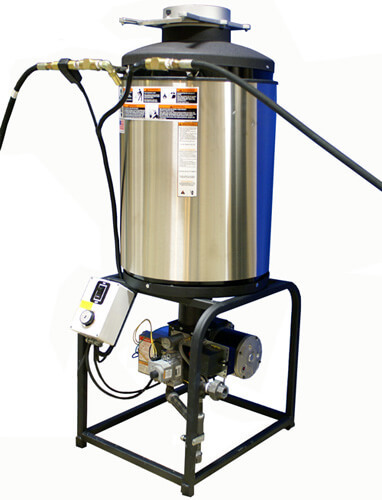 Rugged, dependable, and easy to operate with low maintenance costs, this unit continuously heats as much as 6gpm up to 195°. These forced air burners can be attached to any cold water pressure washer to make them into a hot water pressure washer. Gas Volume necessary to obtain 140 degree temperature rise. Shown in inches of water column. Variances in gas delivery due to outside temperature, tank capacity levels and facilities total gas usage dictates a less that adequate gas supply resulting in poor combustion and coil soot buildup. 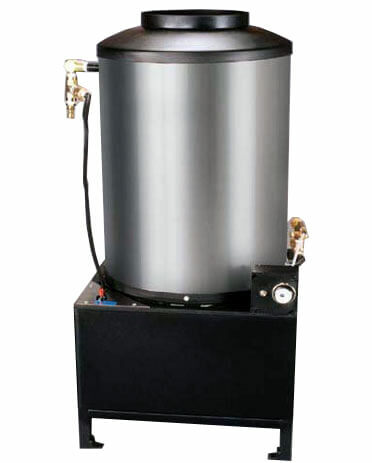 The new forced air burner requires 30% less fuel to operate and eliminates soot buildup. 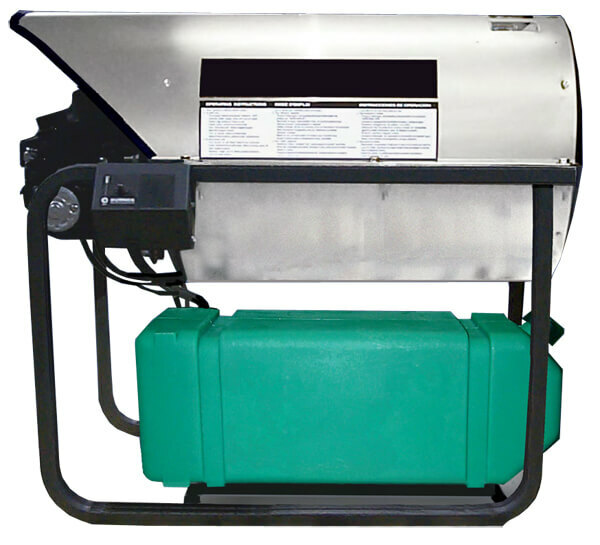 11" 3" to 5"
Burner blower system provides air flow to insure 100% combustion of fuel. The new forced air burner eliminates soot buildup resulting in costly repairs and poor temperature rise. Burner system senses proper air flow for combustion. The new forced air burner senses for adequate airflow and combustion. If the sensors reveal unsafe conditions the system automatically shuts down. No safety monitoring system. Integrated safety monitoring system. All burner components are designed, assembled and provided by one manufacturer as an engineered system. The new forced air burner includes the blower, gas valve, gas regulating system, electronic ignition, burner orifice and safety sensing system in one bolt on package that provides dependable operation, easy troubleshooting and service. Burner components are provided by three or four different suppliers. Fully engineered package from gas inlet to burner orifice. Burner base is sealed eliminating intrusion from rodents causing costly damage. The new forced air burner blower system provides all the intake air necessary for combustion and eliminates that naturally asperated burner ring that was open and allowed rodents up into the coil. This eliminated costly repairs and potential fire hazard of igniting the rodent nesting material. Open base allows for any rodents to contaminate the burner chamber. Sealed base keeps all foreign material and rodent from entering the burner chamber. This image does not depict the exact models. If you are not sure what is the right coil for your burner, download the spec sheet below and send it back to us via email or fax. Made from high quality spun ceramic fibers. Composed of long, high strength fibers needled into a tight blanket with superior handling properties. Superior thermal conductivity calues. Completely inorganic. buildup in heating coils, restoring them to peak performance. Comes in 4 lb container or purchase by the case.